We all love our feline friends and we would do absolutely anything for them, but, let’s face it, there is one job that, let’s just say, we’d rather not have to do, given the choice. Yes, scooping the poop! It’s that time of the day (or night) that calls on you to face the dreaded litterbox. It isn’t the most wonderful job in the world and it’s not very hygienic either and usually it ends up all over the place with dust all over the floor, but we do it because we love our furry friends and also the cleanliness of the house. So if you dream of litter free days then there could be a solution in the Litter Robot II a pet safe simply clean automatic litter box. The Litter Robot II is very hygienic and is suitable for a multi cat household, which means you’ll be free from the litter box and your house will smell delightful. It is perfect if you travel quite a lot or are away from home for a couple of days a week, as the drawer can hold a few days worth of waste with minimal odour. Let’s dip in and take a closer look at how this sophisticated simple to use device actually works, and how it will stop you from having to scoop poop again. The Litter Robot LRII is an automatic, pet safe simply clean litter box that does the messy work instead of you, which means that you will be free of all the mess and smells that comes with having to scoop up and clean your kitties litter box. It doesn’t matter if you have more than one cat in your household as this device will cater for all your felines. 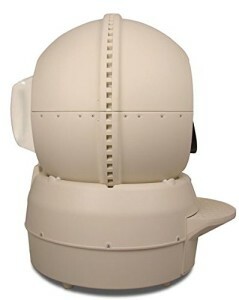 The design of the Litter Robot II is unique and is operated by a rotating mechanism or globe which separates the poop from the good litter. Then once it’s done that job it will go on and send the waste into a receptacle, which is located at the base of the machine. 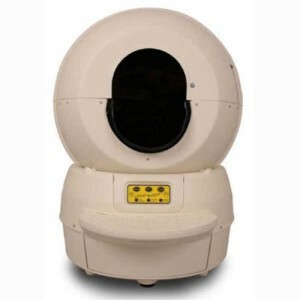 Your cat will step into the Litter Robot II where its weight will be detected by a sensor. Your cat does his businiess. Then finally, when the cat exits the litter box a seven-minute countdown is triggered and when the seven minutes is up the litter box will begin to automatically clean everything up. When the seven-minute countdown ends and the litter box is on zero the globe will ever so gently start to rotate, and will begin the job of separating the messy clumpy litter from the fresh, clean litter. The clumps are then dropped into the waste drawer at the base of the unit and it’s in this drawer where the carbon filter is located to help with good odour control. If your cat should happen to re-enter the litter box while the litter box is carrying out the cleaning cycle, as a safety measure the globe will rotate very slowly and the whole unit will shut off automatically for the safety of the cat. The unit will wait for the cat to exit and then after 15 seconds will restart again. However, if the cat stays in the unit the globe will not rotate until the cat leaves. The Litter Robot II pet safe simply clean automatic litter box doesn’t need hardly any maintenance or cleaning because there isn’t a rake mechanism, so there isn’t anything in there to get jammed. The only job you will need to carry out is the changing of the bags every now and then once they are full. This clever device will let you know when the bag needs changing, which compared to facing all the mess and smells of a normal litter box this has to be the way to go. You will never, ever, have to clean out a litter box again, so put that scoop down! The area inside the Litter Robot II can easily hold a cat up to 15 pounds in weight. If your cat is lighter than 5 pounds in weight or you have a kitten then you will have to operate the device manually. You will need to use clumping litter or biodegradable cat litter with the Litter Robot II. Filling the litter box is very easy to do. It is quite a large device, so you will need quite a bit of space in the room it will be going in, but you don’t have to worry about noise as it is very quiet when carrying out a cleaning cycle. Here’s a nice little explainer video on the Litter Robot LRII. See the item on Amazon. No more scooping manually, the Litter Robot II will automatically do the messy jobs for you. It is easy to set up, just plug in and begin. You will not need to purchase trays; it’s all built in, less expense for you. Less odour thanks to the large carbon filter. You will not need to spend money on supplies, everything you need is included. The Litter Robot II is pet safe and is comfortable for them to use. The Litter Robot II has been designed and built to last so once you have one you should have it for a long time. It is suitable for a multi cat household so every cats needs are catered for. The Litter Robot II will save you money on cat litter. Your cat’s paws will stay nice and clean thanks to the sifting system. Easy disposal, the waste goes into the drawer at the base of the litter box. The Litter Robot II is perfect if you travel frequently or are away from home for a few days. The drawer can hold a few days of bagged up waste, with minimal odour. Once your cat has left the box there is a seven minute delay which greatly helps in reducing odours. There is a manual cleaning cycle that can be used at the push of a button. You’ll have much more time to spend with your cat rather than spending a lot of time cleaning out the litter box. The Litter Robot II pet safe simply clean automatic litter box comes with a manufactures 90 day money back guarantee and a full 18 month warranty, with the opportunity to extend to 36 months if you wish to do so. No more messy jobs and smells. Comfortable for your cat to use. Ideal if you’re away from home for a few days. Suitable for a multi cat household. If your cat is small or is under 5pounds in weight it will have to be manually operated. The Litter Robot II is perfect if you don’t want to be scooping the poop all through your days. Just switch it on, your cat does its business, leaves the box and then the cleaning cycle begins. What more could you want? No more messy jobs, no more smells and you and your beloved cat can enjoy quality time together, which is what it’s all about really.